Family F03 is a hallway shoe storage, equipped with a wall panel with three coat hooks, mirror and two convenient shelves. It is the ideal composition for a big hallway, to help organize at best clothes and shoes starting from the moment you arrive home. The cabinet with two hinged doors features a kit of 12 metal shelves, holding up to 36 pair of shoes. 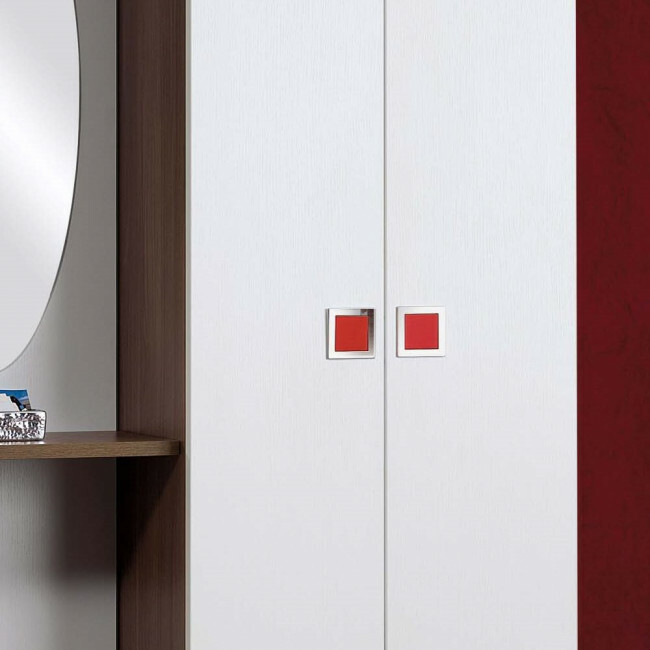 The panel is equipped with three rhombus-shaped coat hooks available in different colours and characterized by a chromed detail. 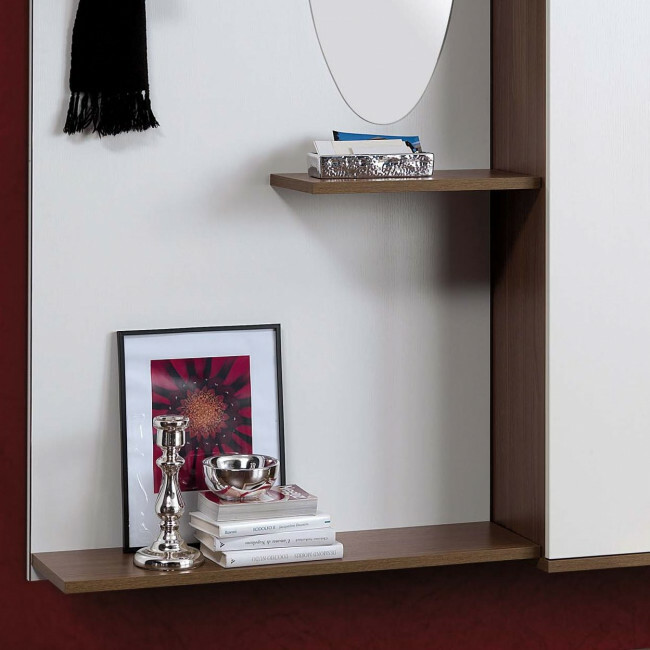 Family F03 is completed with additional details such as mirrors and shelves. 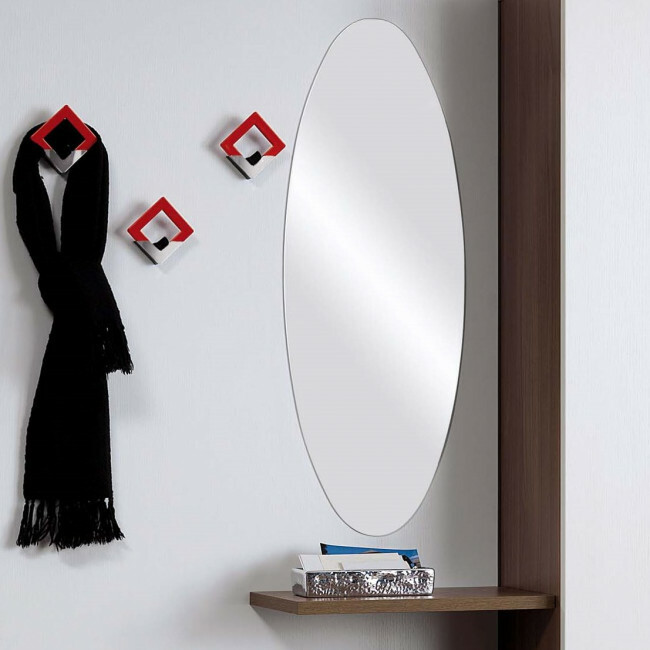 The mirror is perfect for a quick touch up before leaving the house and the small shelf can work as a coin tray, for your change and keys. In order to use at best the composition, it is possible to place a long shelf in the lower part of the panel guaranteeing even more space for other objects. 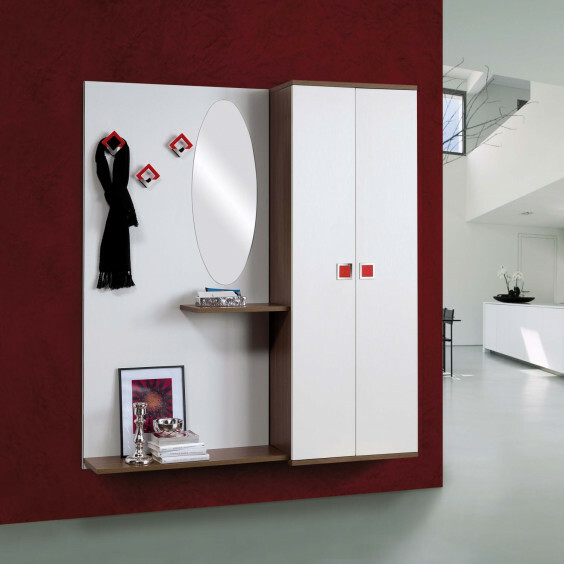 - 1 cabinet with Canaletto walnut structure, streaked white hinged doors and red ABS handle. We suggest to place the wall panel 20 cm above the floor to optimize the height of the elements. Shoe-rack kit: cm 60, chromed metal. Family F03 belongs to Family collection, which gathers modern hallway furniture, designed to offer a high level of flexibility in terms of configuration. Panels, cabinets, hooks, shelves and drawers allow a great deal of customization in terms of sizes and finishes. Compositions can be equipped with additional mirrors, coat hooks and drawers, shelves, shoe-racks, storage units and ironing kits.